People give all kinds of excuses when it comes to reading! What got us thinking about this was the comment by a member of the audience during the book reading with Chimamanda ; I don’t read! As strange as this sounds to book lovers, the stark reality is so many Nigerians have lost the culture of reading. Although the guy in question has been cured of his inability to read, the same cannot be said of many Nigerians especially our young people. In this age, where social media and blackberries – some call it the disease of the hands! – have become the in thing, many can’t be bothered to read. What is most baffling isn’t their ‘inability’ to read, rather it’s the excuses they give. The common excuse and perhaps, the most consistent is the ‘I don’t have time’ excuse. But one wonders, in this jet age, when everything is on the fast lane, is there really time for anything? What is even more surprising is that those who fall into this group, especially Lagosians, sit in traffic for a minimum of four hours daily! Imagine how much knowledge you could gain in four hours! Some others are of the opinion that reading is boring. Well, it depends on what you are reading! No one is asking you to read history textbooks or philosophical texts. You should enjoy what you read, if you enjoy love stories, then read love stories, if you enjoy detective novels, then go right ahead! Don’t read because you are compelled to do it; that erases the beauty of it all. Read at your pace, if it takes a month to read a novel, that’s fine. Don’t let others dictate your reading pace. And for those who complain about inadequate resources, well, you could save towards it. If you have no qualms about saving up to buy a phone, then buying a book should be no different. Also, it depends on where you buy your book; some Farafina books are as low as N500. Most non-readers are ignorant of the benefits of reading which is why they give excuses that don’t hold water. We understand the challenges of living in a country like ours but nonetheless, we create time for those things that matter to us. So, really reading is a choice that’s up to you to make! You can read about tips for reading here and the benefits of reading here. Hope this will make you rush to a store and buy a book! *Full list of Farafina titles. *Want to buy? You can buy from these bookshops or a stockist nearest to you. You could also buy directly from us at 253, Herbert Macaulay Way, opposite Stanbic IBTC bank, Alagomeji, Yaba or call the office at 017406741. We also deliver (charges may apply)! Farafina at Bayelsa Book and Craft Fair! The city of Yenogoa comes alive as it plays host to members of the literati who have gathered for the first Bayelsa Book and Craft Fair. Already there is a line up of Nigeria’s best scheduled to attend this event. It will be an opportunity to buy books, artwork and most importantly, networking! If you are a young writer, this might just be the opportunity you have been looking for! From creative writing workshops to book readings to spoken word sessions, the organizers have put together an impressive line up of events. Writers expected at this event include Professor Akachi Adimora Ezeigbo, Odia Ofeimun, Wale Okediran, Molara Wood, Jude Dibia, Toni Kan, and our very own Eghosa Imasuen. This is the first edition and Farafina will be there to attend to your literary needs! So, if you are in Yenogoa, please visit our stand! Fair holds at the Niger Delta Wetland Centre, Ekike, Yenogoa and begins on the 24th and ends on the 26th of March, 2011. 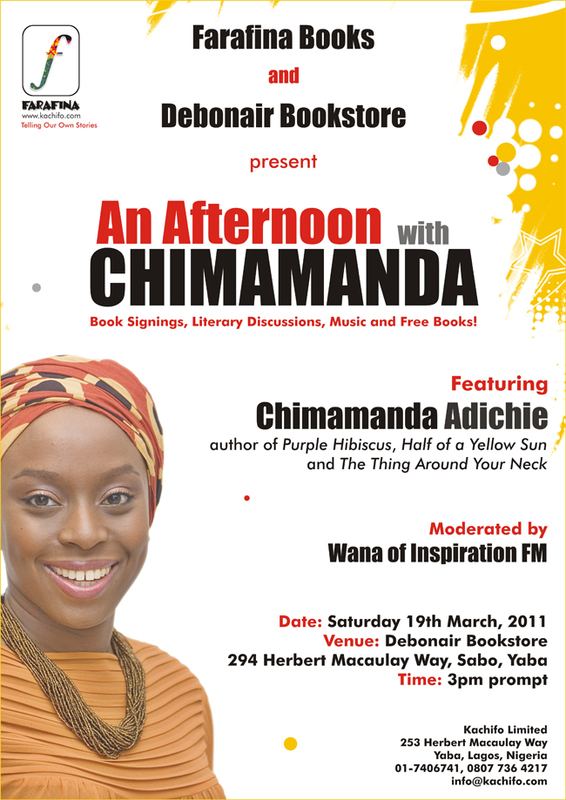 Finally, the much talked about event, ‘An afternoon with Chimamanda’ took place last Saturday. As early as 2pm, guests had arrived and were waiting for the event to start! Chimamanda started by reading an excerpt from The Thing Around Your Neck after which she answered questions from the audience. She revealed that she started writing at the age of five and got her first publication as a teenager. ‘I fell in love with books as a child’, she said. In ten years’ time, Chimamanda said she sees herself writing and impacting her society through arts and culture. Writing, she said requires a lot of dedication and commitment as she spent four years writing Half of a Yellow Sun. She disclosed that Half of a Yellow Sun was borne out of the need to fill a gap in family history. She encouraged upcoming writers to overcome rejection as this will boost their self-confidence. On overcoming writers’ block, Chimamanda, who was named one of 50 most Inspiring African Feminists, says she tries to avoid it by stimulating her mind with the works of others or in extreme cases, she lies down to sleep! The event took an interesting twist when someone asked her if she was romantic! 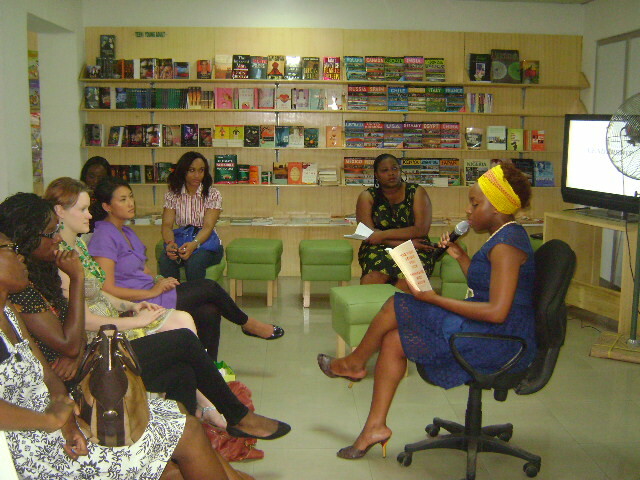 After the Q & A session, there was great music by Dolapo and three guests got book gifts. The event ended with book signing by Chimamanda. It was a well spent afternoon judging by these pictures. *As part of efforts to improve the political process, Chimamanda will be moderating a presidential debate on the 25th of March in Abuja. You can read about it here and here. Book signings! Book readings! Music! Literary discussions! Free books! 19th of March by 3pm. Now, here’s one event you don’t wanna miss! If you want to write a book, take out a year and self-educate! Award winning author, Chimamanda Adichie was in Yola recently for a book reading at the American University of Nigeria, Yola. The venue was packed full with hundreds of students who came to listen to one of Africa’s most celebrated writers. Well, it was worth their time as she gave them crucial writing tips. Baba Segi on 2011 Orange Prize longlist! Hearty congratulations to foremost poet and Cassava Republic author, Lola Shoneyin! Her debut novel, The Secret Lives of Baba Segi’s Wives is on the 2011 Orange Prize longlist. Lola joins nineteen other female authors whose works have been nominated for this year’s prize. The Orange Prize for Fiction, UK’s only annual book award for fiction written by a woman, was created in 1996 to celebrate excellence, originality and accessibility in women’s writing throughout the world. The judging panel for this year is chaired by Broadcaster, Historian and Author, Bettany Hughes. Other judges include founder-director of Bloomsbury Publishing and Full Circle Editions, Liz Calder and novelist, Tracy Chevalier. The prize is open to any work of fiction written by a woman in English, irrespective of her nationality, country of residence, age or subject matter. Previous winners include Farafina author, Chimamanda Ngozi Adichie for Half of a Yellow Sun (2007). We are excited Lola has been nominated and we hope she wins! Farafina Books @ NYSC camp! So, another set of graduates are heading to camp today for the three-week orientation camp. Well, most of them are out to have fun, meet new people and just have a good time! We believe it should be more than that! Having a lot of time on one’s hands is also an opportunity for self-development. As they say, a reader today, a leader tomorrow! To this end, Farafina Books will be at the 2011 Batch A orientation exercise taking place at the NYSC camp in Iyana Ipaja. As usual, all our titles would be available at steep discounts and there would be loads of freebies to give out also! So watch out for our stand! To view the complete list of Farafina titles, please visit our website, http://www.kachifo.com.